I recently had the opportunity to meet up with this man to get to know him before the interview, see how we connected (or if we didn’t get along), etc. If you follow me on Facebook or Twitter, it’s pretty obvious how it went. If not, I’ll give a summary of the events below. So I had anticipated this meet for about a week, and on the way there I was shaking. Finally arriving where google had led me, I called him up, stood outside my car and waited. Being too excited to think, I didn’t look at the addresses and parked about 100 feet away from his place. In any case, we met and went for a walk by a river. For two hours we got to know about each others’ past, present, and aspirations for the future. We both agreed during the third quarter of the walk that we’d get along well, which is a big deal for him (and to get along with Jay is a pretty big deal to me, as well. I’ve admired this guy for quite some time). 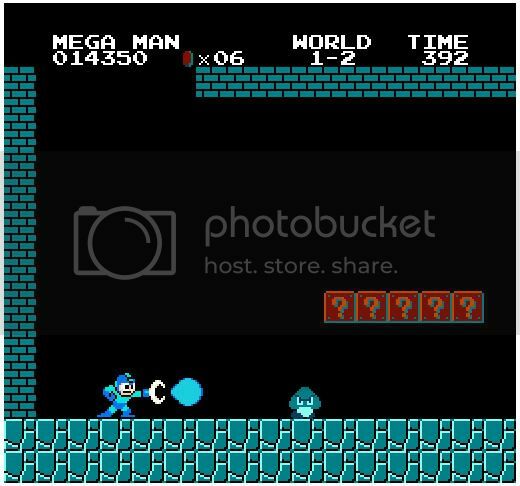 Everyone could use more Mega Man in their games. Next up was meeting with his wife Iggy at Panera. While waiting we talked about video games. Might I say it was quite refreshing – there’s something about finding a common interest you are both passionate about is just so relaxing. Not to mention at this point we had gotten more accustomed to the company of one another. While speaking on the topic of Final Fantasy XIII, Iggy came in. Following this was more video game conversation, introductions, project talk, offers, etc… Basically, it was during this time that it was decided I’d be working with Jay in the future on things beyond the interview, so if you happen to follow Jay (or me, as I’ll be advertising his stuff on facebook) at all, you’ll probably see me elsewhere on the internet at some point. After this came the last portion of our hanging out, which included all of us playing games together and seeing what he’s been working on. While I can’t disclose any details of what I saw or what he said, I can say that it is all pretty amazing, and will blow some peoples’ minds. So look forward to it! Oh, and if you’re wondering how he is in person… just watch his videos. He’s no different, other than the fact that he’s talking to you. Genuine, funny, and one of the coolest people I’ve ever had the opportunity to meet and call my friend. And let’s not forget about Iggy, who is also a welcome addition to the friend category. Our interview takes place on March 10th, so look forward to that in the near future. And if you have any questions for me to ask (assuming they aren’t things previously answered), leave them in the comments or email them to me at jason@fistfullofpotions.com and I’ll ask them at the beginning of the interview. Images used are not my property, and I do not claim them to be. My apologies for not having images from the encounter, but I wanted to respect Jay’s privacy and not give out any contextual clues as to his whereabouts for the sake of his safety. There will be video of the interview, so you’ll see us together plenty in the future.